I’m a big fan of dewy, glowing skin. I have never been able to pull of the matte look when it comes to foundation or lip products. I love that look on other people, but I need some glow to look alive — but not so much that I look oily. Above you’ll find my two very, very favorites for brightening my skin and making it look dewy without looking oily, and the best part is… they don’t cost the price of your kidney on the black market. First up is the Herbivore BRIGHTEN Instant Glow Mask. Y’all, I love this stuff. I use it 3 days in a row before a big event, and once a week if I don’t have much going on and I’m just trying to maintain my skin. It is an all natural mask and is made with fruit enzymes, rice powder, and tourmaline gemstone. I’m not going to lie, I have not jumped completely aboard the all natural train so I’m not going to pretend I have (much of my skincare does not fall in the all natural category). BUT, if that’s something that’s important to you, this fits the bill. If that’s not important to you, that’s great too because this will also work great on you, and I’ve tried all the stuff with all the chemicals too, ha! Something I really like about this mask is that it has a gentle exfoliator. Most of the time I find that many products with exfoliating properties are too abrasive for my skin type, and honestly, they’re probably too abrasive for most skin types. You want it to slough off dead cells, not tear the skin. So, I am super particular about masks and my skincare products in general, and let me tell you I really really love this little guy. He is linked below and only a whopping $48 and lasts a really long time! I order it from Nordstrom because it ships for free. I’ve tagged it below for you! Tips for use: Only use this mask at night as you do not want to expose skin to sunlight directly following use. Use SPF during the day after using this mask to maintain results and avoid sun damage. Slight to moderate tingling is normal with this mask. Be sure to stir it before applying since some of the components may settle. Next up, Mario Badescu Facial Spray with Aloe, Herbs, and Rosewater. Y’ALL. This stuff is amazing. I use it to set my make up if I actually put a full face of it on, and if I don’t, I use it in the morning, after the gym, and throughout the day just to refresh my face. I will even give myself a spritz after my night creams and before bed if my skin is feeling really dehydrated. I really think it is the product that makes the biggest difference in how my skin looks and feels. It is very much a water based product and not at all oily, like you may think. It really helps hydrate your skin, and also has soothing components that help with redness. 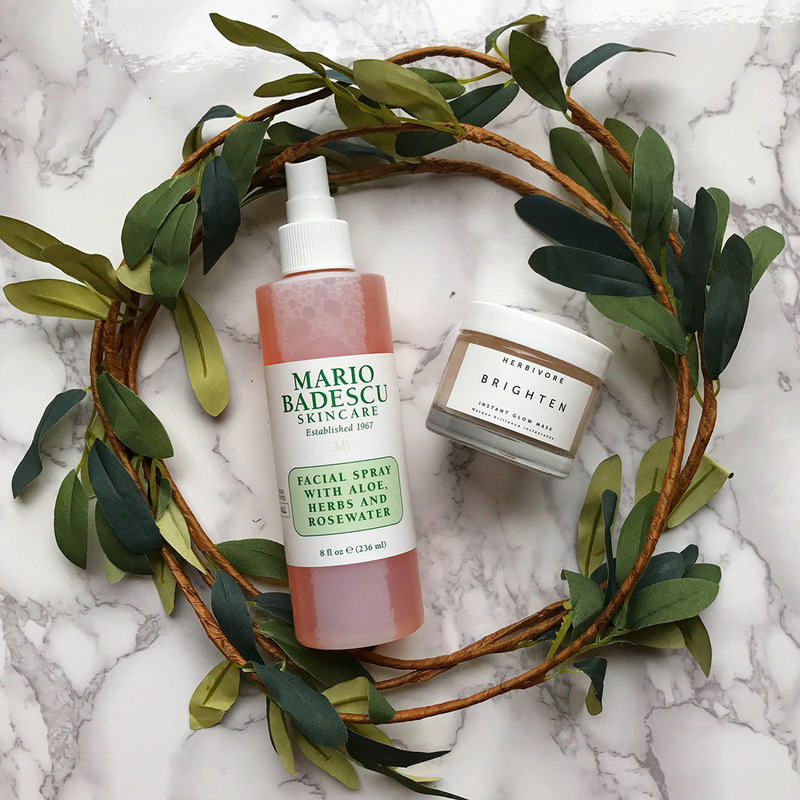 Mario Badescu says it is for all skin types. I linked two different sizes of this product below. One is 4oz and is $7, if you want to just test it out to see if it’s for you first. The second one is $12, and it is an 8oz bottle if you’re feeling confident, girlfriend. Directions: Mist onto face and neck throughout the day, as needed to give your skin a quick boost anytime, anywhere. Spray your day and night creams for a boost of hydration or use it to set make-up.